First, be aware that many types of glass stones are misidentified as Gripoix. This is especially true with ruby red and emerald green glass stones in pieces copying Chanel’s signature colors. They are most often simply glass cabochons. That is, a molded glass stone with a completely rounded top. The origin of these components is usually unknown so sellers are using the term Gripoix generically, and incorrectly, to describe them. As beautiful as it is, most costume jewelry collectors run across today was made in mass quantities. Manufacturers like Coro and other large companies made millions of pieces in their heyday. By and large, Gripoix glass was not used in the run-of-the-mill mass-produced costume jewelry of yesteryear, and it is not used in that type of jewelry today. All Gripoix glass jewelry is made by hand. It was in 1868 when it was first produced, and artisans in France are still making glass jewelry components now using the same techniques. 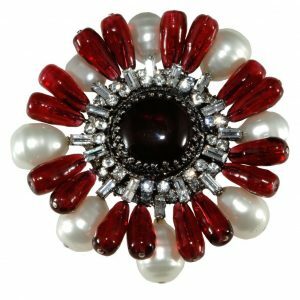 Beads, cabochons, coated pearls, and other glass components like these will be found in jewelry made by Chanel, Dior, Balenciaga, Givenchy, Isabel Canovas, and Pierre Cardin along with other European couture houses. A limited amount of jewelry also bears the Gripoix name. It can take many man-hours to produce a single design. When glass is “poured” directly into a setting, it is sometimes evident when examining the back. Cabochon stones and beads usually have slight nuances from stone to stone since they are handmade, as noted in the Gripoix brooch shown here. It was too expensive, and still is, to use this type of French glass crafted by hand in lower quality jewelry. Many molded glass imitations, however, were used in less expensive, non-couture pieces. If you find a piece of intricately crafted jewelry incorporating genuine poured or finely blown glass components in the design, it’s well worth looking into the origin and having the piece professionally evaluated by a costume jewelry expert. Older pieces containing Gripoix glass are extremely valuable, so you may have a true treasure on your hands. Like the name Gripoix, poured glass (pate de verre in French) is another term thrown around quite frequently by jewelry marketers, and most of those attributions are incorrect. What they’re purporting as poured glass is actually molded glass. The metal-framed molded glass petals forming flowers widely used by Trifari in the 1950s in both milk white and opaque colors are a good example. These were used to imitate poured glass, and have their own place in the history of costume jewelry. They were not made by Gripoix or any other high-end atelier known for making fine glass jewelry elements. True poured glass was, and still is, achieved by carefully using a soldering torch to place molten glass directly into a metal frame. The individual elements are then polished and eventually soldered together with other components to form a complete piece of jewelry. The videos linked at the end of this article are very helpful in understanding the techniques used to craft Gripoix elements. Some of these components can look a bit crudely made from the back, others are more finely polished. The early pieces designed by the House of Chanel and other European couturiers from the 1930s through the ‘60s are quite valuable and coveted so learning to recognize them behooves the educated collector. Even newer poured glass couture pieces are quite popular and desirable. The jewelry crafting techniques developed by Augustine Gripoix in the mid-1800s are still being used by Gripoix Paris. This type of glass jewelry has also been made by Augustine Paris, a company led by Augustine Gripoix’s great-grandson, Thierry, since 2007. Keep in mind that not all jewelry produced for a particular couture house contains handmade glass components. Some are made using Austrian crystals or other glass elements along with plastics (often referenced as resin when the origin of the plastic is not known), natural stones, and other materials. Houses like Givenchy and Dior made varying levels of jewelry ranging from couture to more mainstream collections, so not all pieces by a particular brand will contain glass made by hand. Learning to recognize Gripoix glass takes study and practice. Generic molded glass petals framed in metal like those used by Trifari and other companies in the 1950s. This vintage molded glass flower was incorporated into a contemporary Lawrence Vrba brooch. Photo by Jay B. Siegel. Note: Click on each image for a larger view. 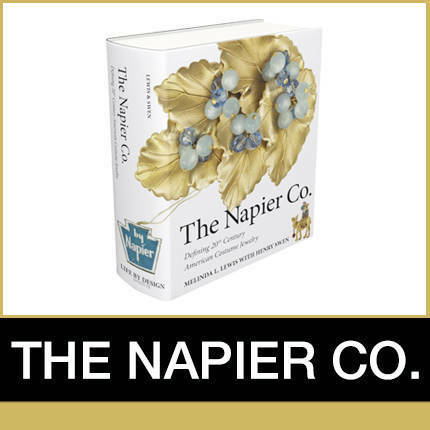 Pamela Wiggins Siegel is the author of Warman’s Costume Jewelry, which includes additional information on identifying poured glass and dating Chanel costume jewelry.